This post goes out to all the lovers. Whether that special person in your life is your wife or girlfriend; husband or boyfriend. The person that puts up with your footballing obsession deserves a special thought at this time of year, with Valentine’s day almost upon us. In my case, it’s the wife, who not only lets me sneak out of the house twice a week to go and play 5-a-side, but also puts up with me moaning about my injuries, and patiently helps me find my football socks that always seem to go missing 5 minutes before I need to leave for a game. Really, she’s the ideal 5-a-side WAG. I’m sure you’ve heard the term ‘WAG’. If not, where have you been?! It’s a term that was coined by the English press to refer to ‘wives and girlfriends’ of footballers at the 2008 World Cup. That tournament, more than anything, propelled the position of WAGs from mere support-act, hiding in the background of the big football comedy, to front of stage and, in many cases, playing a leading role. Incredibly, over the last decade being a WAG has become a ‘career aspiration’ in its own right and is the ‘profession’ of choice for far too many young girls these days. Depressing as this sounds, however, many of our most famous WAGs have been extremely successful with real life tales of going from ‘WAGs to riches’ (no, I’m not going to apologise for that pun). Coleen Rooney’s book is said, for instance, to have sold more copies than her husband Wayne’s. Whilst the professional football WAG leads a life of ease and glamour, which appears to involve driving from beauty appointment to beauty appointment in a large 4×4 vehicle, these people don’t seem to live in the real world. Their images are all over our tabloid papers and we read about them all the time, but what about the 5-a-side WAG? Who in the media has ever spared a thought for them? That’s right, nobody… Until now. Before we go any further, it’s worth doing a little compare and contrast between the professional WAG, and your real-life 5-a-side WAG. Maintenance: The professional footballer makes enough money to maintain his WAG in a life of luxury. A 5-a-side player, on the other hand, pays for the privilege of playing. 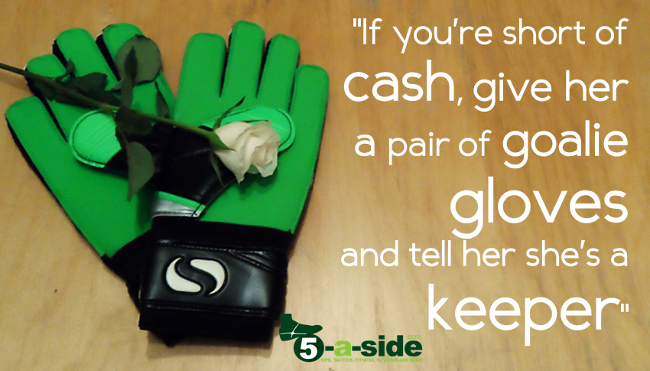 The 5-a-side WAG, thankfully, tends to have much more realistic expectations – partly out of necessity. Who has ever seen the 5-a-side WAG cantering down Kensington High Street telling her friends how her other half’s glorious Thursday night 5-a-side was what paid for her new Louis Vuitton handbag!? The professional WAG demands Michelin-star dining; the amateur WAG gets Nandos and loves it. Keeping busy: The 5-a-side WAG actually has real things to do: work, study, being a mum. Let’s not tar all of the professional WAGs with one very large dirty brush, they do appear to have rather a lot of spare time on their hands. This can lead to disastrous consequences, including twitter rants, reality TV appearances, and spending time around John Terry. Kiss and tell: Read the tabloids and you soon get the impression that, up and down the country, nightclubs play host to apprentice WAGs who studiously immerse themselves in the art of loitering around, drinking large amounts of Bacardi, and lying in wait for potential footballers. Every so often this results in an infamous kiss-and-tell story coming out with all the unneccsary details of the romantic liaison that followed. The great news for you as a 5-a-side player is that you can walk into a pub or club without having girls throw themselves at you. Yes, really, what a benefit. Coming to watch your games: The TV cameras will often scour the crowds at games, searching for a shot of famous WAGs. If your WAG comes to watch you play 5-a-side, it’s highly likely that she will be the entire crowd. As you can see, the life of a 5-a-side WAG is a much simpler, much more sustainable, much more beautiful thing. And for that, I for one am very grateful. Considering that she puts up with your football, without getting any of the professional WAG’s upside from it. That’s truly special thing. Although Neil was trying to enjoy his date, all he could think about was how the lads needed him at 5-a-side. Yes, she knew you were into football when she first met you. She’d often wonder how the radio had managed to switch mysteriously from her favourite songs, to that dreadful football phone-in the moment she fell asleep in the car. She even knew about your soft-addiction to playing FIFA on your chosen games console. But frankly, she didn’t expect that you’d be disappearing twice a week to play football with the lads every single week for the rest of your life. The fact she puts up with that is remarkable. So let’s celebrate it. Here are my tips for giving just a little bit back and making sure that your 5-a-side wife or girlfriend doesn’t end up loathing your favourite past-time. It’s so simple, but this one could really be a life-changer for you both: buy some shoe deodorant. In my house, the humble abode that it is, I’ve got a small little entrance hall (I say ‘hall’ but you should picture something more cupboard sized) in which we keep all of our shoes. 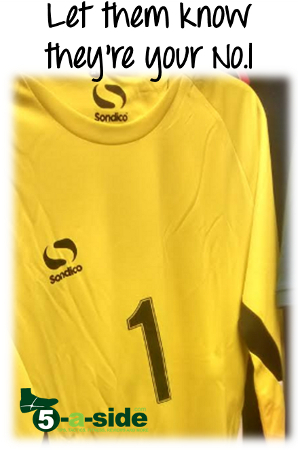 After 5-a-side one night I placed my Football boots on the shoe rack, shut the door behind me and went upstairs. The next morning I heard a sinister scream from my wife. I thought we’d been burgled, but apparently it was even worse. She’d gone downstairs and opened the door to the tiny room where I left my shoes and the smell had nearly killed her. The pungent aroma from my shoes had percolated all night and created a vile concoction that she described as “making her feel sick to the pit of her stomach”. That’s when I knew I had a problem. 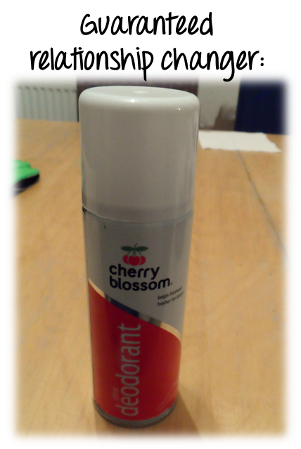 Now I’ve got my cherry flavoured shoe-spray, things have been different and she no longer looks at me in the morning after football with complete disdain. So simple, but so effective. If you don’t have any, pick some up next time you go to the supermarket (it will cost you less than £2) or steal some from your local bowling alley when the attendant isn’t looking (no, please don’t). 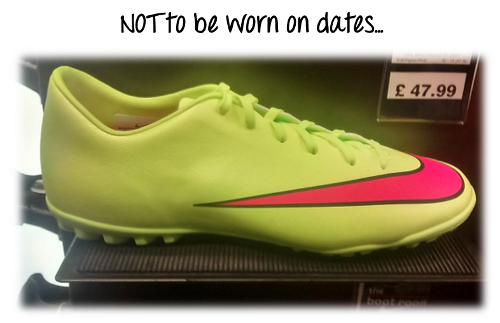 Never rush out to a date wearing your football trainers (or indeed anything else you might wear to play 5-a-side in). Whilst you might feel it to be a matter of convenience and leave you optimistically ready for a game at any time, no woman is going to be impressed when you show up at her door to pick her up for a date wearing your astros. The words “wow, I love your Nike Mecurials” are words that have never, ever been uttered on any serious date. Ever. You can’t organise a defense without communication. Similarly, you can’t actually try to have a relationship without communicating either (although I don’t recommend at any point shouting “PICK UP YOUR MAN”). It’s best to let your significant other know that you’ve got 5-a-side well in advance of the event. Don’t end up double-booking yourself because there’s only one winner in that scenario (clue: it won’t be you). 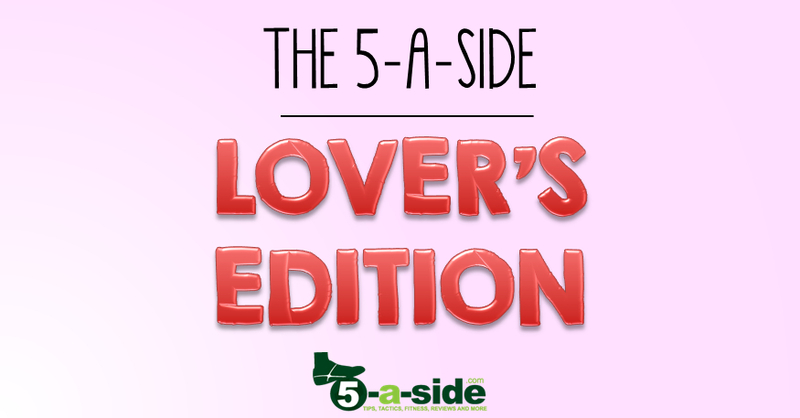 The time when we always find out who wears the shinpads in a relationship is when your regular 5-a-side night coincides with Valentine’s Day. It’s surprising how many last minute cancellations you get on the night along the lines of “something has come up”, rather than conceding that they’re not allowed to come out and play. If you’re not already in a relationship, I haven’t forgotten about you. 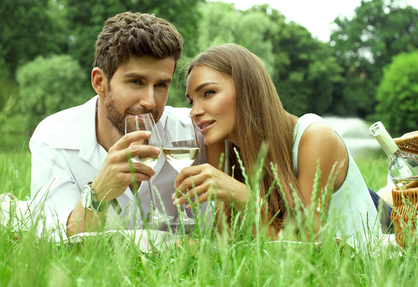 You want to know how you can woo someone special this valentine day, don’t you? Hardly the sort of romantic gesture that’s going to find its way into a classic romantic novel. On second thoughts, maybe you should just go and buy a card. So that’s it, I’m sure this article has been very little practical help at all. But I hope it made you smile. Whatever your plans, whatever your relationship status, I hope that Valentine’s day brings you and yours a very happy time.